Today Miss Sky had special plans to go on a field trip with her Big Sis. They went to the Children’s Museum to see the King Tut exhibit before it left the city. Sky couldn’t have been more excited to go but to spend the day with her big sister was a special memory of its own. So that left Little Sis and I time to spend together. While fixing breakfast Little Sis rounds the corner with one of her favorite stories in hand ready with todays plans. She is quite capable of dictating orders of her own when Sky isn’t around. With one hand on her hip she informed me we needed to make some cookies to eat while reading her story. I asked her if she had any particular kind in mind. Chocolate chip was her reply as if there was any other kind. So after breakfast and clean up Little Sis and I started baking. She was thrilled to have both beaters to herself and commented on how jealous sissy will be to find out she had cookie dough. After storytime Little Sis decided we needed to build a mouse home. The basket of blocks was brought out and we went straight to work. Before we knew it Miss Sky was home sharing the details from her day. Little Sis couldn’t have been happier to have Miss Sky home but a quick chocolatey grin in my direction let me know she enjoyed our time together. The festivities started early with the findings of new crowns upon waking this morning . The nature table displayed new treasures of the season. Celebration rang thru the air. For breakfast I made apple bread while that baked I prepared the meatloaf that would be our lunch later on. After a moment of groans during clean up it was finally time for our circle. We sang our transition song along with our morning songs , we said prayer, then Miss Sky told her memory verses from Revelation 12:7-9. I read the verses from yesterdays post and read the story http://www.waldorflibrary.org/Clearing%20House/Fall%201976.pdf on page 3 for Little Sis. Since the dragon helped bake the towns bread we made our dragons bread to eat with lunch. I used the recipe here http://naturenest.wordpress.com/2008/09/25/dragon-bread-a-recipe-and-a-verse/. Thank You Little Naturenest for your links to Michaelmas. Then for main lesson today it was Miss Sky’s turn to tell back the story form yesterday. She chose to act the story out assigning everyone’s part. Papa played the dragon, I was the king and the pleading towns people, Little Sis was the brave knight, and of course Miss Sky was the beautiful princess. Miss Sky drew her picture in her MLB .http://www.flickr.com/photos/24734949@N04/3967578588/. She wrote her sentences too being Big Sis and she have special plans for tomorrow. Papa helped make their shields and The Little’s decorated them. Well, I think it is safe to say that Autumn has most definitely arrived here in Indiana. With the temperature reaching to the low 60s and 40s for tonight it may be time to start the first fire of the season. I have noticed, at least here, that each season this year has had a strong start. Hmm, wondering what winter will bring. This weeks activity has us preparing for the celebration of Michaelmas. The day started with a great yoga and meditation time this morning to really gather my thoughts and to run today’s flow through my head. Inner work this week has me really searching inward reflecting if I am where I want to be or if I need to slay any dragons that could be holding me back. For breakfast, I made waffles with sausage while The Little’s started their chores. I also started the minestrone soup for today’s lunch. Miss Sky and I cleaned up after breakfast and we started circle time. I found at this lovely blog. There is a Michaelmas song at the end of this post as well http://holywoodsteiner-classthree.blogspot.com/2009/09/in-autumn-st-michael.html. We did our apple finger plays, reviewed our past lessons on the penny whistle and finished up with some tongue twisters. We transitioned into bean bag by taking turns tossing the bean bag into a basket with our foot. Then Miss Sky and I did a math review from all four of the processes. It was time for the main lesson I told the story of St. George and the dragon http://www.mainlesson.com/display.php?author=bailey&book=hour&story=george. They have several at mainlesson.com. No spelling or vocabulary this week due to the festival. For grammar, we reviewed what Miss Sky has learned about nouns so far. I tied in the form for the week using a running form that looks like dragon scales. We practiced first in the air, then on the board, then on each other’s backs. We wrapped up the main lesson with beeswax modeling. 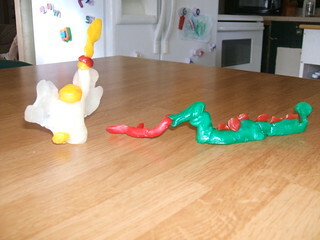 We modeled St. Micheal and the dragon. We said our closing verse and took an hour break for lunch and free play. Sky finally learned how to ride a bike (with 2 wheels) and has been riding around the backyard as much as she can. Little Sis informed Papa over the weekend that she was ready to ride a bike and told him to get one right away. For story time I am still reading Little House in the Big Woods and coming to the chapter Harvest for tomorrow which is good timing. I finished Little Sis’s crown for tomorrow. Sky is reading Mystery of Case D. Luc and working on Little’s Sis cookies for her birthday. Wishing everyone a happy, healthy, safe Monday. When venturing out into the woods there are many important things one must bring along. A watch and a map are not one of them. We love exploring natures trails never knowing what adventures might await you around the next bend. For just a moment time stands still while you take in all the beauty that surrounds you. That’s just what we did this time with a new member at our side. Our puppy Harvey seems to have a love for nature as much as we do. He trotted happily along the side of us making sure to hit every puddle along the way. We kept our eyes open for signs that fall had in deed arrived. We ran into some new sightings. And met up with some old ones. After the day’s adventures, we were ready for a little quiet time. It’s memories like these of not having your destination planned out but always arriving right where you were meant to be, that I know will follow us along our journey. It’s finally arrived, Autumn. It seems it was just last month I was sitting out back looking up at the tree buds anxiously awaiting spring. Now a walk around the block proved the leaves are ready for fall. With each new seasonal change, the nature table has been set up awaiting any new treasures that might be found. Also, the fall stories have been brought out waiting in the basket for little hands to sort thru, finding old favorites along with a new one. Into our bed, the little ones hop with stories in hand. Of course, the new story is first. Mama has searched for the perfect Autumn story and the smiles across the Little’s face lets me know I chose right. Then the favorite story is read. What would Autumn be without The Apple Cake by Nienke van Hichtum? This isn’t just a favorite of the Little’s but has become a family classic. Well, how could you read a lovely story as that without wondering into the kitchen to make an apple cake for breakfast of your own? So that is what we did. With our bellies full it was preparation time for another fall treat. Nicely waiting for snack time. After clean up, we stuck with the same circle time as yesterday. Little Sis is loving the apple verses and continues entertaining us through out the day. For the main lesson, I told the story The Big Red Apple http://www.mainlesson.com/display.php?author=bailey&book=hour&story=apple. We talked about how the animals are preparing for fall. The next few days lessons take us outside getting our hands dirty. Wishing everyone a happy fall season. This morning after dragging myself out of bed and trying to talk myself out of yoga. I managed sun salutations and a very much needed meditation. The hardest part is just starting. This morning Papa surprised me with breakfast thanks to a “Little” persuasion. It’s funny how things can work out like that. So with no morning clean up we started circle time. After our circle I gave Miss Sky her spelling test then she copied her form from the week in her MLB. It was time for Miss Sky’s drama class. I spent some good quality time with Little Sis reading some of her favorite books while we waited on Sissy. Once home we started on cooking project number two, honey cake. Using the recipe from The Family Treasury of Jewish Holidays we followed each step. I have to be honest we don’t eat very much sugar. I am always cutting the sugar in recipes by half . The recipe called for 1 cup honey, which would be plenty for us , along with a cup of sugar. Not wanting to break tradition of serving anything sour or bitter I stuck with the recipe. The Little’s were some what worried about the addition of coffee in the recipe but they must have forgot I added it . I baked the honey cake for 40 minutes instead of an hour and am glad I did or it would have been over cooked. While the cake baked I read the story Maybe Even Higher from the same book. With all the business Fridays bring I thought I would get one of two cooking projects done today. So The Little’s and I got to work on making Challah bread saving the honey cake for tomorrow. I used the recipe from The Family Treasury of Jewish Holidays. We formed the bread into a shape resembling a crown since Rosh Hasanah is the “head ” of the year. It turned out better than I thought and was SO yummy. We dipped our pieces in honey which is tradition after the blessing. After filling our tummies Miss Sky and I got to work on some handwork projects. Little Sis has a basket of projects she likes to work on along side of us. I just had to snap a shot of her determination. Aunt Laura this ones for you :). Today’s flow started different then most days. We had plans to attend the back to school homeschoolers skating party this morning but they fell through. So I had a few minutes of meditation trying to put the pieces of the day together. We planned on having left overs for breakfast and I just stuck to the plan with everyone having something different. With two very disappointed little girls we started circle time with Papa trying to unglue their frowns. Of course he succeeded. We continued working on lesson two with our penny whistles and counted by fives forwards and backwards during beanbag. We stomped out the sums (I mean the product 🙂 ) to the five times tables and passed the beanbag back of fourth working whole to parts. Today for main lesson Sky came up with three sentences about Rosh Hashanah to write in her MLB. http://www.flickr.com/photos/24734949@N04/3927285096/ I gave Sky her practice spelling test and made her copy the words she missed 5 times. We finished looking up the rest of her vocabulary words and I drew a big spiral on the driveway with chalk for form drawing. We walked the form inward then outward then Sky practiced on the driveway with chalk. Today we painted the star of David with watercolors and took our break for lunch. http://www.flickr.com/photos/24734949@N04/3926503527/ I made grilled ham and cheese sandwiches with carrot sticks. After free time Sky started The Mystery Of Case D. Luc #6 of the Cul De Sac Kids and I read Little House in the Big Woods. We read for 30 minutes each while the other does their handwork project. We finish the day with our closing verse There Lives In Me An Image http://waldorfjourney.typepad.com/the_gnomes_home/2009/09/sept-7th-show.html. I am so glad Melisa posted it because it’s such a great verse. Tomorrow is errand day and I think I will be catching up on some handwork projects for upcoming Little’s birthdays. Many Blessings to all for a great day. We looked up the first 5 in the dictionary and she circled the abstract nouns. She practiced her spelling words in corn meal sounding out each letter. Sky practiced her form in the cornmeal too. This week we are using inward and outward spirals for the inner reflection during Rosh Hashanah and the spiral of the challah bread. After breaking for lunch having beef fajitas I made last night and playtime we finished up with storytime and handwork. Sky finished her book and is ready to start number 6 of the Cul-De-Sac Kids.